Time to try to win another windchime to hang outside and drive the neighbors nuts. You have through 5/29 to enter. Continental US only. Good luck. In case that 74" in title doesn't sink in that quickly, these are over six feet tall. Holiday Contest and Sweeps along with a great group of blogs has teamed up with QMT Windchimes to bring you a Windchime of all Windchimes, the QMT Corinthian Bells 74" to bring you a Windchime of all Windchimes, the QMT Corinthian Bells 74" (6ft .16inches) will resonate that of rich bell tone of Church Chimes.. The T-446 will turn your backyard into the peaceful retreat that you have been dreaming of. 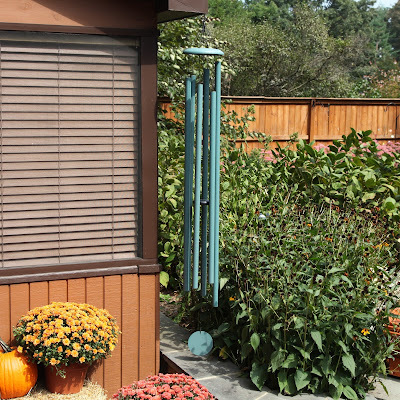 The sleek length of this chime blends well with mature landscapes. It's graceful tones will sooth away the stress of your day. This amazing chimes comes in a variety of colors including Black, Patina Green, Copper Vein, Green and Midnight Blue. One lucky reader whom resides in the Continental United States and is 18+ years of age will win their very own set. Proudly made in the USA, Corinthian Bells wind chimes combine excellence in design with incredible tones and resonance. These are visually and acoustically exceptional chimes. The centrally suspended heavy-walled aluminum tubes along with the high density striker give these chimes their outstanding tones and resonance. The tubes are powder coated to match the dome and wind sail, giving a complete finished look to the chime. 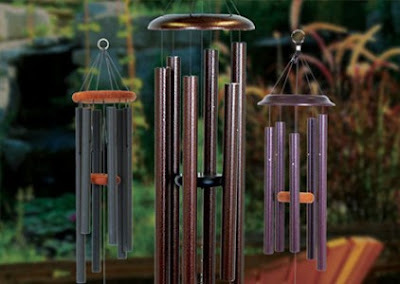 QMT Windchime has the world's best selection of various shapes, sizes and colors that you will not find any place else. Check out their website today and view all the great selections they have to offer. Click This Link to hear the beautiful tones of the T-446 Don't wait any longer, just click here to visit the QMT Website.